A quartet including three members of the Colby College music faculty visits Bates College to perform music from France’s famously creative “Belle Epoch” at 8 p.m. Saturday, Nov. 4, in the Olin Arts Center Concert Hall, 75 Russell St. In a concert titled Belle Epoch: Chamber Music of the French Salon (1880-1925), mezzo-soprano Elizabeth Erskine Patches, pianist Cheryl Tschanz, cellist Adele Adkins and flutist Lee Humphreys play music by Ravel, Satie, Debussy and others. Sponsored by the Bates music department, the event is open to the public at no cost. For more information, please call 207-786-6135. The program offers a musical glimpse of France from the late 19th century through World War I, when Paris was the center of an artistic, technological and social ferment that percolated through the Western world. During this period, French composers found ways to synthesize a restrained, lyrical classical tradition with a welter of new influences including impressionism, jazz and world music. Patches studied at the University of Michigan with the world-renowned French baritone and pedagogue, Pierre Bernac, a student of Maurice Ravel and someone for whom Francis Poulenc wrote many melodies. Patches continues Bernac’s artistic legacy in her teaching at Colby and on the concert stage. Tschanz’s ability as a pianist was recognized early. At 7, Clavier magazine credited her with “startling qualities of great talent,” and at 11 she made her major orchestral debut as guest soloist with the Cleveland Symphony Orchestra. Since then, she has played in solo performances and with orchestras and chamber music groups throughout the United States, Canada, France, Italy and Finland. She is assistant adjunct professor of music at Colby. Humphreys played principal flute with the Orquesta Filarmonica de Caracas, in Venezuela, and with the Hong Kong Philharmonic. She is now principal flutist of the Maine Chamber Ensemble and a member of the trio Musica Sorella. She has taught at Bates and is currently the applied music associate in flute at Colby and principal flutist in the Colby Symphony Orchestra. 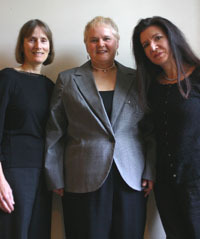 Adkins has a master degree from the Juilliard School, where she studied with the late Leonard Rose and Harvey Shapiro. Now associate director of the Maine Center for the Arts, in Orono, she performed for two summers with the Los Angeles Philharmonic.